By default, Grove Collaborative is a fully customizable auto-replenishment service that puts your favorite products on a recurring schedule of your choosing! We suggest a schedule to help keep you stocked and on-budget with your home products, and at any time you are welcome to make adjustments to better suit your family's needs. There is no requirement to order monthly, and you are more than welcome to edit what comes inside of your orders as well as when they are sent to you. These scheduled shipments are stocked from your product subscriptions, and are completely customizable. You can edit the frequency your subscribed products load into your cart, as well as add or remove any items from your cart. Lastly, you can change the date your items will ship without penalty, by using the "Change Ship Date" button from your cart to either postpone an order, or schedule it sooner. 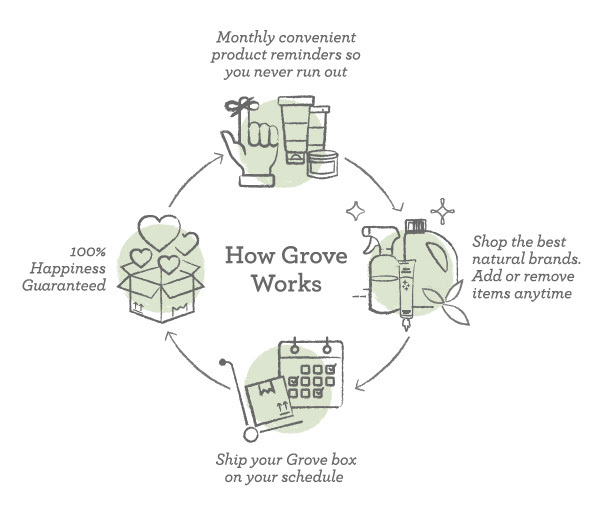 If you're not quite ready to commit to scheduled shipments, you can still shop with Grove on an as-needed basis. To do so, click here, then click "Pause Auto-Shipments." This will allow you to continue using the site without automatic orders. Keep in mind, we do have lower order minimums for those who stay with our auto-shipment program. To learn more about order minimums, click here.